Use this thread to post what you find, and where! Let your fellow collectors know what's up. Minor local discussion is ok, but try to keep it focused on the toys and finding them locally. Looking out for the Dayton Metro area. I've got the Massilon Walmart, Target, and K-Mart covered. Not sure if there's any other T-cat fans in the area, lol. Edit: If I can, I'll also try and make occasional trips over to the Walmart in Wooster, and the TRU in Canton. Last edited by Ravenxl7; 07-31-2011 at 09:55 PM..
they show up on the receipt as "6 inch collector figure"
Sword was $19.99 and the figures were $14.99 each. The 4 inch figures they had were $6.99. FYI, wilykit and kat in the 4 inch line looked good next to the 6 inch figures. I have checked 3 K-Marts, 2 Targets, 2 Wal-marts and 1 Toys R us around the Parma/Middleburg Heights/Strongsville area, and all were complete strike outs. No pegs or stickers for their "area" in the toy aisles, nothing. I'll make another lap in a few days to see if anything has changed. Sorry for the double post, but an update: the Toys R Us in Parma has the large classic Lion-O. Think he was like 12 - 14" tall? I'm only after the 4" inch figures so I dunno the specifics. He was $24.99. They did not have anything else unfortunately. Was at the Walmart in Wooster, and they haven't put anything out yet. Though by the looks of it they hadn't even started to reset things. Super K-Mart in Brooklyn (just south of I-480) has figures!!! I just picked up Wily Kit and Kat, the small Mumm-Ra, and large Mumm-Ra. They also had the roll play sword and the Thundertank. No classic figures yet. Went to the Massilon Walmart before going to see the new Planet of the Apes movie. Not a single thing. Only Thundercats related item I saw was the first box of the original show on DVD (hadn't seen it for a while). If they still got it, but no figures, by Friday, I might get it, lol. KMART on Brice Road in Reynoldsburg/Columbus has 4" and deluxe 4" in stock, but NOT ON THE SHELVES...You HAVE to ask an employee to go in back to find them. Toys R Us in Dublin has EVERYTHING... Well, HAD... Now down to 4" Lion-o, Deluxe 4" Lion-o, ALL 3 Mini Vehicles, and Classic Tygra and Lion-O... TRU Polaris (north Columbus/Westerville/Worthington)will supposedly being doing a large end-cap display sometime this week. I now have everything I want!!!! WOO HOO! I am doing Classics, and 4" andna few deluxe and vehicles here and there! Just left Kmart in Barberton. Had all the tags on the pegs but no figs as of yet. I will keep checking through the weekend. Got the chance to go to the TRU in North Canton earlier today, and unless I was just missing them, they didn't have anything Thundercats out. Also went to Massilon Walmart again, and still nada there too. Kmart brooklyn/parma had a bunch of stuff. Kmart on broadview had nothing. No tags or anything. Tru parma had zero 6" and 8". Wilykit and kat and tygra were the only 4". Had the deluxe and tank. 14" liono was also there. I left them all on the pegs. Well... Columbus Area Toys R Us in Dublin has PULLED all the Thundercats items because it was BARE! They have 1 each of the classics, 1 4: Lion-O, 1 6" Lion-O and 1 6" Panthro....THATS ALL!!!! They are supposed to be doing a relocation of the Cats on THURSDAY this week when they have more stock (Truck comes in Wednesday night). Polaris TRU (North Columbus) has said they STILL plan to put them out, but nothing I could see on Saturday. And the East Side Columbus TRU (Groves Road/Hamilton) has just a few 4" and 6" ones left on shelves along with the MEZCO 14" Lion-O. Good thing is: THEY ARE SELLING LIKE HOT CAKES!!!! So we will likely get to see some DREAM Figures made in this lines gang! If we get the quantity (and SOME Quality) like Ben 10 over the 2 year run of the show, we are going to have one HUGE toys shelf filled with the Cats! North Columbus TRU/Polaris DOES have a small bit left... put out 1 case of 4" while I was there, 4" Deluxe Lion, MANY Thundertanks and Fig/Vehicle sets. In Isle 5D with the Toy Story and Phineas and Ferb Figures (oddly)...NO TAGS! Seems like a Temp fix. Central Ohio Walmarts should ALL have toys on shelf this week! But, NO 4" DELUXE FIGURES... Three locations have no tag on their shelves for them, and I scanned all my tags and brought them in, The Deluxe Tygra and Lion I used are NOT IN SYSTEM, but all others ARE! The Walmart in Brooklyn has done their reset and have some of the figures. They had a few of the 4" singles, a couple 4" deluxe (Tigra and Lion-O were there this morning when I left, I bought Slithe), and the Classics figures. There was a Tigra and Lion-O there. I bought a Tigra. Toys R US In Dublin/Sawmill got 1 case of EACH assortment today...And they believe it may be their LAST until September!!! I picked up GRUNE (Now I have ALL 4" variations/sets etc... HOOOOOO!!!). Walmarts ALL have their Thundercats out, and 5 locations I checked had NO DELUXE 4" (No Grune, Ever Living winged Mummra or Tygra/Lion-o with action Pedestals), but they have the Vehicles and all 4", 6" and Classics. But wait: On the Walmart front, some locations (for example The Britton Parkway/Dublin, Ohio) will NOT CARRY THUNDERCATS UNTIL FALL/WINTER!!! Got it direct from a toy lead/CSM! He said it is the smaller Super Centers that wont get them until later. No KMART updates! But, MEIJER STORES (and Thrifty Acres) do not have them YET, but said they have orders for them to arrive the first of September! And guess what? BBTS (BIG BAD TOY STORE) http:/www.bigbadtoystore.com has them coming in Thursday AND Friday and will start shipping this weekend! Get them while you can....!!! 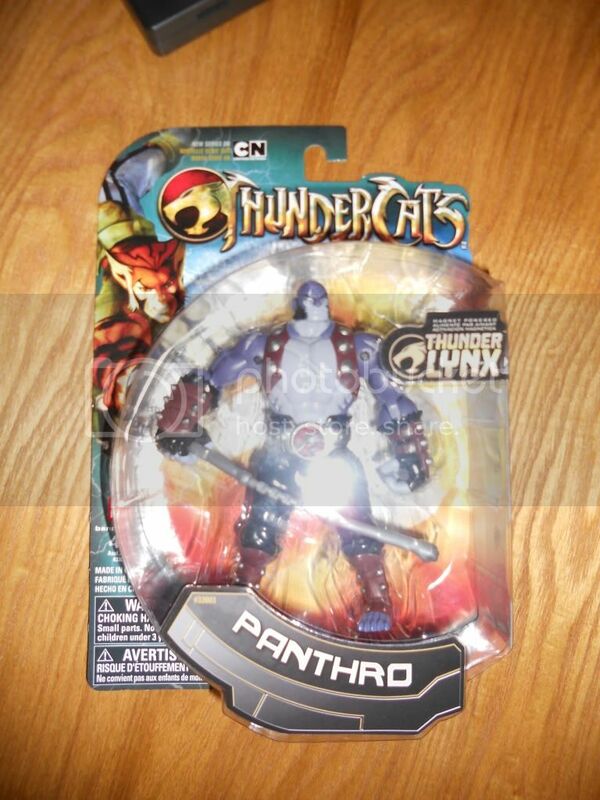 Hi, found at ToysRus here in Niles Ohio, also found an odd Panthro that hast he back crad of Tygra, pretty sure its a mis-print but sanged it. Last edited by Stellerwolf; 08-17-2011 at 07:08 PM.. Struck out again at Walmart in Massilon. Mad a good amount of their reset done, but I could definitely tell it wasn't over. I would've searched through the large pile of boxes just sitting there if I had the time. If I get the chance I might go and check out K-Mart sometime. If not I'll be going back to Walmart again in another two weeks, so hopefully they'll have them out by then. Hey Raven, the Canton Walmart on the Strip has them, as an fyi.. Thanks for the tip. Did they have the Mezco Mega-Scale Lion-O in? He's the only one I plan on getting at TRU (I'll gladly wait to pay less at other places for the other stuff). Just left aurora/ bainbridge walmart and they had 2 tower of omens playsets. I bought 8" liono. They still had 1 left and 2 tygras. Had all the 4". Went to Massilon Walmart again today, and I must have just overlooked them while there on Friday. They had everything but the basic sword, claw shield, and 4" Deluxe sets. Got me a Classics Lion-O. There was one left, and several Tygra's. Central Ohio Targets AND Walmarts have the two 6" Classics (Dublin and Hilliard Locations). Target has Wave 1, Thundertank and The 4 Pack. Walmart still VERY Full on wave 1 4". No sign of wave 2. 8" Classic Tygra down to $8.40 though at the Hilliard-Rome Walmart! Anyone seen Wave 2 4" or New deluxe yet? Armor of Omens seen in Illinois (closest state sighting), but no Ohio sightings yet. Storm Charger and Tygus found elsewhere... not in Ohio though. Anyone else got input? BTW: Made a quick cloth cape for the 6" Classic Mumm-ra... Connects easily to wrist spikes! Snagged a 6" Cheetara at the Walmart on Georgesville rd in columbus. Had 1 left after that. This is a nice figure. Shucks, was there yesterday and they had only full pegs of the old stuff! Did they have the armor of Omens or wave 2 4" (Claudus etc.)? Found Gold Armor of omens AND NEW larger Claw Shield and 6" (Including Cheetara) At Walmart on Bethel Road in Dublin Ohio Wills end pics once I find my camera Battery (LOL)... I didn't buy Cheetara, I'm a 4" incher (sounds WRONG, I know). No sign of Series 2 4" though. Found this (LAST ONE!) at Walmart on Bethel Road in Dublin, Ohio (near Columbus). $29.95... The Tuttle Crossing one has them IN-STOCK, but told me point-blank they are NOT opening them for anyone! They plan to put them out in the next day or two (along with ALL the wave 2 figures AND 6" figures they ALSO have in stock, but wont open). Comes in the normal box with pics of upcoming toys (nothing we haven't seen before). The inner box has NO TIES!!!! Just the Figurine and the Storm Charger in bags with directions. The Figure: Mumm-ra is, as we feared, essentially a "Happy Meal Toy". No posability, and has button batteries inside his back. Even has the tab you pull out to "activate" him. BUT, you CAN replace the batteries. AND YOU WILL NEED TO! See, once you plug him into the ****pit, his HANDS STAY ON. Definitely remove him from the Charger for long-term display or storage. Two-tones of molded plastic: Red and Grey, plus the LED hand lights. He does NOT light up on his own (*unless you touch his Thunder Lynx connection point with metal on his back). Only when in the Charger. The Vehicle: This looks AMAZING! Dead on perfect, great paint and STURDY! The eyes on the top of the tank GLOW RED when Mumm-ra is inside. Looks GREAT in a dark room! Press the button to the right of the ****pit/face and the ****pit door closes automatically and the Charger REVS and ROLLS! It BOLTS fast (and runs off 3 AA batteries, not included)... Does not turn... Just in a straight line. And you must hit the button again to turn the engine off (*It does shut the engine off after about 30 seconds). Hit soft to turn off, hit until it CLICKS to open the ****pit again. Smaller than the Thundertank, just barely (almost the same if you remove the "bikes" from the Tank). Like I said STURDY! ****pit door goes on GREAT (Unlike the Thundertank, LOL)! Last edited by thunderbee; 01-16-2012 at 08:18 PM..
Walmart, Tuttle Crossing in Dublin, Ohio: All series 2 4" found, All Series 2 6" (except Tygra... He Comes in next updated batch when we see Deluxe 4" Slythe and Deluxe Panthro etc.) found PLUS Classics. Sadly: ONLY 1 CASE OF EACH was put out. So I have the only Claudus. And I begrudgingly converted to getting into the 6" line, because Cheetara looks so awesome! Only Complaint: The face paint ops on Claudus look "off". Best Improvement: Panthro's Nun-chucks are RED AND BLUE!!!! Bandai actually painted them this time....WOO HOO!!! Toys R Us in Dublin Ohio has the Mezco Mumm-ra. $29.97... Not new Bandai, but its a GREAT PIECE! Tuesday Morning on Bethel/Olentangy River Road Road in Dublin has THE STORM CHARGER for 14.99!!! Just 1... MANY of the other 6" figures (no Tygra), and many of the superdeformed mini/Chibi sets, and several LARGE/Deluxe Sword of omens. Mezco LARGE Cheetara found at Toys R US in Dublin, OH AND Polaris. $29.99... AMPLE STOCK!